Neftaly Prudencia remembers when he was seven years old and his grandmothers turned on the radio every Sunday to listen to Salvadoran Archbishop Oscar Romero give his homilies. “Monseñor Romero was the voice of the voiceless, the one who defended the poor,” Prudencia said. As it is the case for many Salvadorans and people in the Americas, those homilies exhorting people to respect each other, build peace and love the poor left a mark on him. He was one of 90 people who came to SS. Joachim and Anne Church, Queens Village, on Memorial Day to celebrate the beatification of Archbishop Romero, a martyr who was assassinated in 1980 while celebrating Mass. Blessed Romero, who a day prior to his assassination asked soldiers to stop killing innocent civilians, famously stood up for the poor and oppressed. He was one of the 70,000 who died during El Salvador’s civil war, which lasted from 1979 until 1992. Parishioners say the Lord’s Prayer during the Mass to honor Archbishop Romero. Father Robert Robinson, pastor, said that even though the Hispanic group at SS. 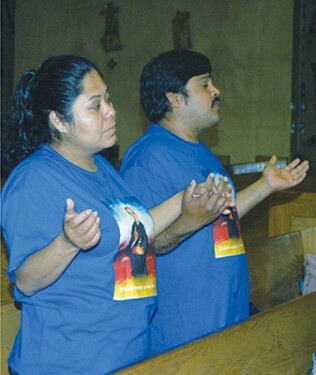 Joachim and Anne is not the largest in the parish, the Salvadorans are very active. “Many lived through the horrors of the civil war and Romero was a comfort” to them, he said. Some have stories like Prudencia’s, ways in which Romero impacted them while growing up. Others never heard his voice, but his message of peace became part of the fabric of their families. Romero’s words also struck a chord with other groups in the parish, like Colombians, Haitians and Uruguayans. When Father Robinson first came to the church, parishioners studied “The Violence of Love,” a book with the archbishop’s sermons. “We found it to be one of the most profound spiritual books we read,” Father Robinson said, brimming with joy at the thought of Romero being beatified. “He just embodies, in a selfless way, the power of the social teaching of the Church. Excerpts of Romero’s homilies were published in Spanish and French in the church’s bulletin, hoping that his example offers encouragement to all. Lizama, who is assigned to St. Nicholas of Tolentine Church, Jamaica, added that he was impressed by the magnitude of the ceremony on May 23. Close to 300,000 people attended the beatification in El Salvador, in what could have been the largest religious gathering in Central America. In his homily, Father Robinson echoed the joy of the parishioners and highlighted how Romero advocated for the respect of human dignity. “Romero is alive and reminds us that professing our faith forces us to be one with the whole world,” he said. Father Robinson also read the sermon Blessed Romero gave the day before he was killed, where he asked the army to stop killing its brothers and sisters. Sanabria added that Romero’s example encourages him and other youth to be passionate, vocal and resolved to defend the rights of the voiceless. 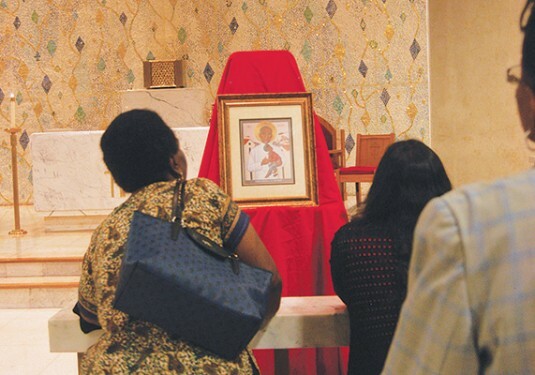 At the end of the Mass, Prudencia played a song dedicated to the archbishop while parishioners gathered at the front of the church to pray before an icon of Blessed Romero.